Since last Christmas, Dad has been hinting around that he wants another pair of hand knit socks. According to my mom, he has been wearing the first pair I made him nonstop and even has a hole in the heel. Now THAT is a compliment! Dad doesn't get online much, so I present this year's socks for him before I wrap 'em up. I've had this shawl on my list for a while, and I finally made it back in the summer. What spawned the creation was me falling in love with this yarn color. Hey, it's a Christmas gift that I actually finished! 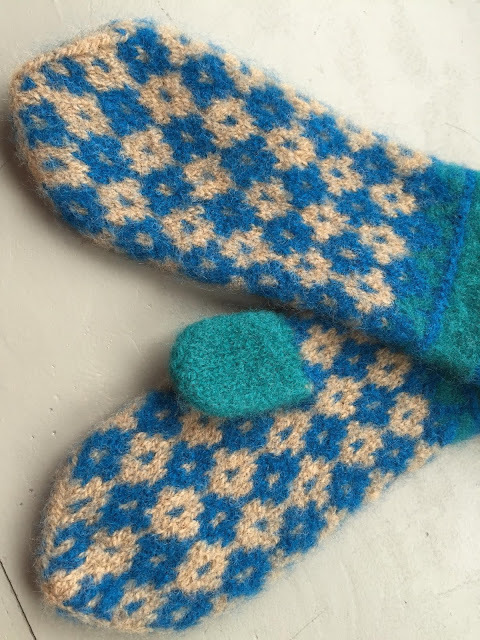 My friend Angela looooves alpaca, and she's more of a crocheter than a knitter, so I thought I'd stitch her some knitted fingerless mitts in her fave fiber. I normally don't make knitted gifts for friends who knit. I'm not sure why. Maybe I figure that if they really wanted them, they would've already made them? (That's not true at all for me!) But I thought since she doesn't really knit much, she'd be a good candidate for these. 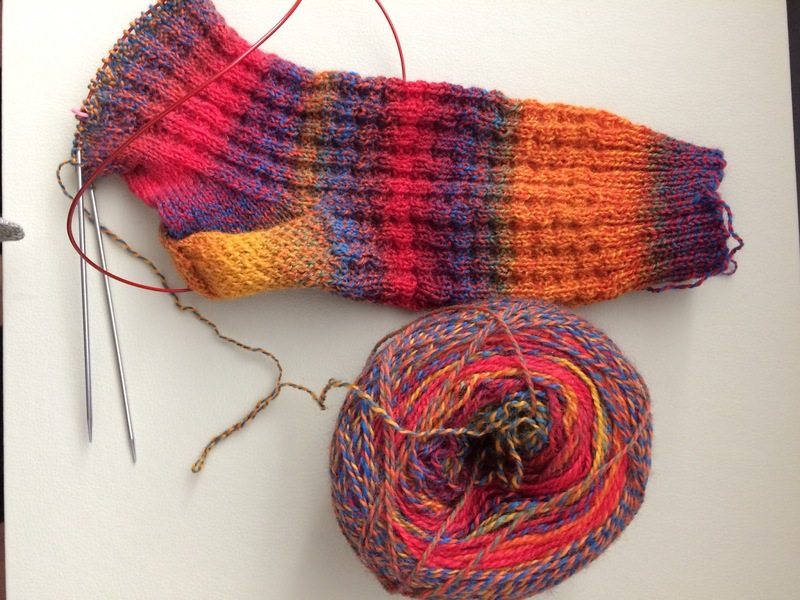 As you probably know, Alex is a sock addict, and I'm addicted to making socks. (That's why our marriage works.) I present the latest pair of knit socks. Lately I've been on a mission to use up as much of my yarn stash as possible. We had a very unexpected snow last weekend, leaving Alex and me unprepared and eating beans for two days. 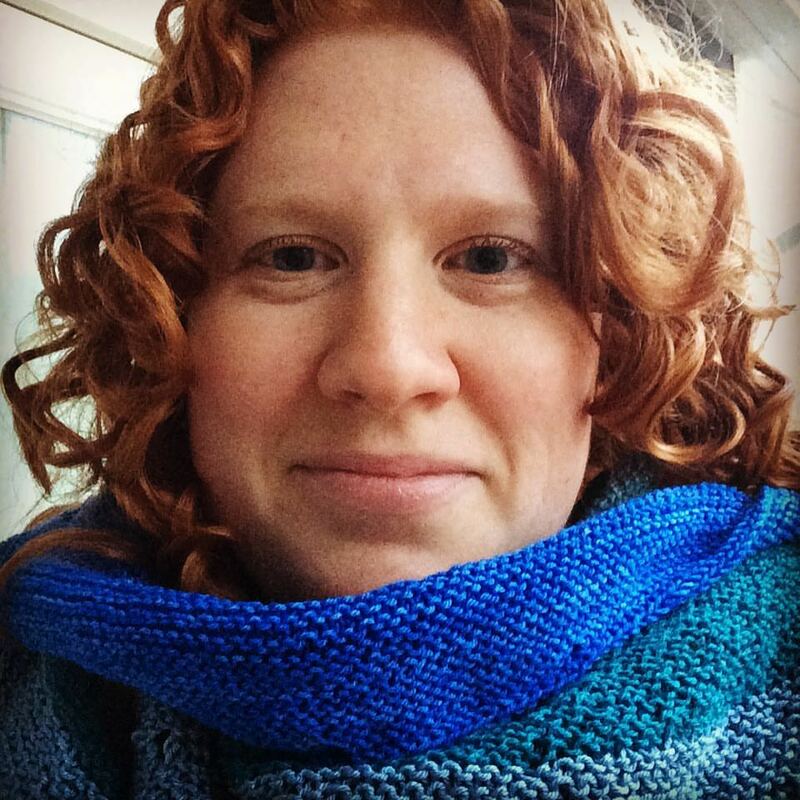 My friend Sami made this cowl pattern for herself, and I fell in love with it. It's from a book called Maine Knits, so it was a perfect gift for my friend Danara who loves Maine and often travels up there for writing workshops. I always set these ridiculous deadlines for myself, and then the deadline doesn't matter anyway because I don't wear the actual finished project. That was the case with this beautiful knit Commonwealth Sweater. I wanted to finish this sweater in time to wear it last Thanksgiving. (Yep, I'm posting this more than a year later.) I did finish it, but when Thanksgiving rolled around it was about 65 degrees outside. That plus packing about 18 people into our house = sweaty guests and hosts, so I didn't wear the sweater. I made this sweater last spring, then put it away until the weather was colder again. Since we have almost a foot of snow on the ground, I think that qualifies as official winter weather. Long live sweater weather! I bought this yarn at a local yarn store, Black Mountain Yarn Shop. It was on sale since the yarn has been discontinued, and I was a little hesitant about the color. Even though it was labeled as gold, I felt like it was a little too close to my pale skin tone. In college my roommate had a shirt that was the same color as her skin, and every time I saw her from across the quad, I thought she was naked. I sure didn't want to recreate that shirt. The color was a bit hard to photograph, but it's almost the same color as our Evil Kitty. The sweater was super easy to knit, but I'm not 100% pleased with how the yarn feels. It's a little rough and scratchy, so I've mostly been wearing it over top of other things to add a layer between the sweater and my skin. It's still pretty, though, isn't it? My crafty friends -- you know, the ones who made me this awesome hoop for my wedding -- always trade birthday gifts, and three of the gals have September birthdays. 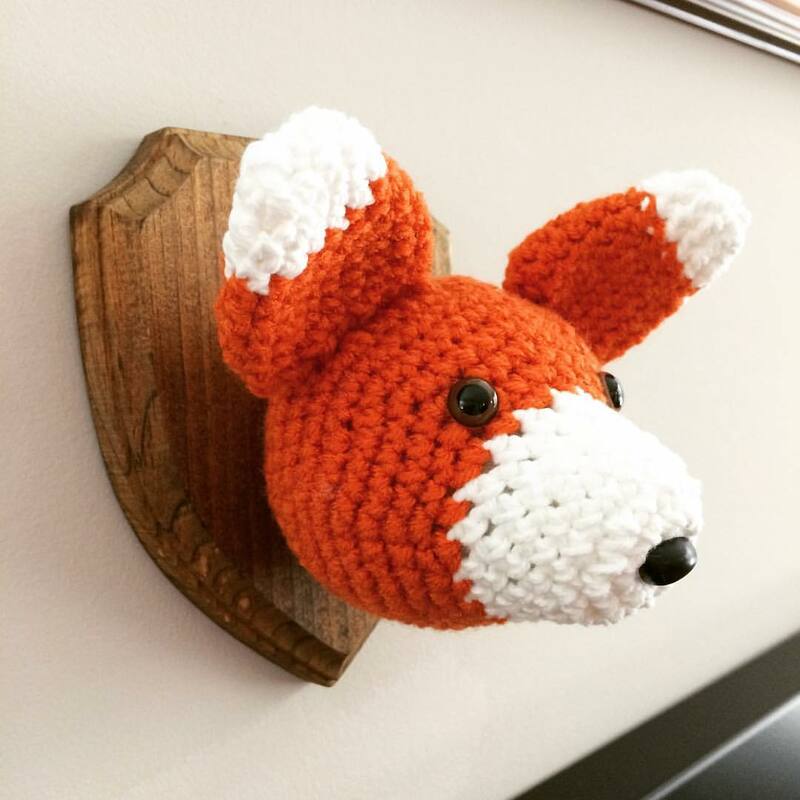 This year, I decided to make everyone a crochet taxidermy animal. I'm kinda obsessed with these lately, and I think everyone needs one! Plus when you have an endless stash of yarn like I do, you have tons of color combos to play with. And Krista got the toucan. I rarely jump on fiber and stitching trends, but thankfully I have cool young family members like my cousin Madie to keep me on my toes. 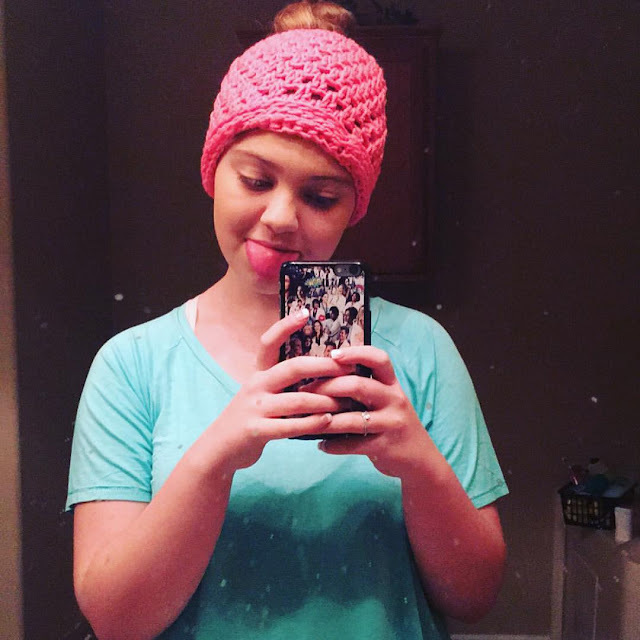 Madie messaged me after Christmas with a photo of a bun hat. She wanted to know if I could make her one, so I said sure. Alex frequently sends me articles about the health benefits of knitting, but it wasn't until recently that I really started to appreciate those benefits. My uncle Billy passed away last week and as I usually do when we're going on a trip, I brought my knitting with me for our trip to see my family in Kentucky. Knitting at a time like this seems silly, but I didn't realize what a comfort it would soon be. 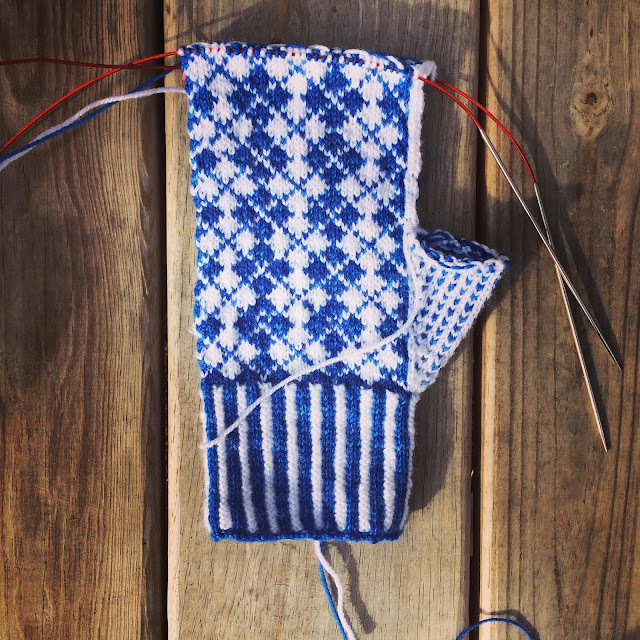 I'm currently working on Little Cabin by Caitlin Hunter, but really I could've been knitting an endless swatch of stockinette stitch and it would've still been helpful. When someone I love passes away, I'm looking for a distraction and a break from feeling the weight of the sadness. Knitting provides just that. I'm counting stitches, I'm looking at charts, I'm reading directions, I'm feeling that back and forth movement of the needles. And it's comforting. I don't know why, but it's comforting. Death brings up so many terrible feelings, and I'm not saying that we should avoid or ignore them. But sometimes those feelings are overwhelming and so painful. 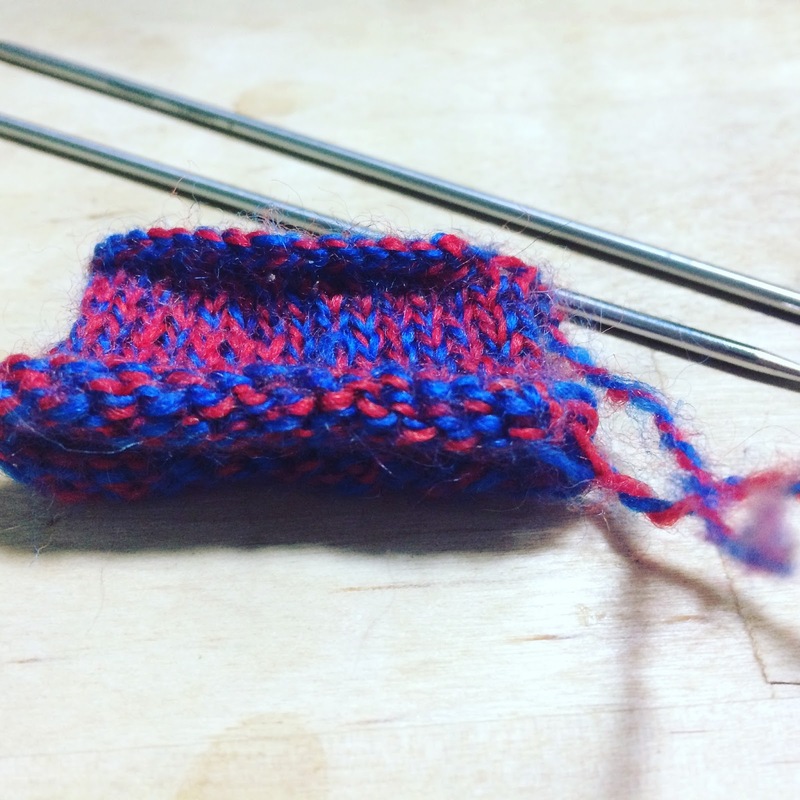 Knitting can bring a temporary peace and calm that can help us feel better even if it's just for a few minutes. I was talking to Alex about Billy's talent as a mechanic and his love for old cars when Alex brought up an interesting point that bridged my knitting with Billy: my family is full of people who do things with their hands. Mechanics, electricians, sewers, crocheters -- we all love working those fine motor skills, and we're good at it. I never really thought about that before, but it made me feel that much more connected to other members of my family. At first I was worried that every time I look at this sweater, I'll think of my uncle Billy and be sad. But I think it might just do the opposite: I think it will serve as a little tribute to him every time I wear it. Holy moly. I've been through it with this sweater. I'm a huge fan of Amy Herzog's designs, so I was really excited to start this sweater. I didn't plan it out super well -- funny, since that's the fit tip Amy so constantly drives home. The lack of planning caused me to take soooo long to finish this. Earlier this year (yeah, I'm a little late in relaying this exciting info), I found out that Stephen West was visiting Black Mountain Yarn Shop. Cue the freak out. Stephen was in Black Mountain last year, and the tickets sold out in minutes. I was so bummed that I missed him. But he came back one more time (the man is forever traveling everywhere), and it was a simple meet-and-greet event. Yarn: SO many yarns!! Most were sock yarn scraps. Instead, my friend Sami had the great idea to just bring the project and work on it at the shop. I felt like a little kid, holding up my art for Stephen to praise. A rare selfie of me wearing the shawl for the Instagram #YarnLoveChallenge I participated in. Here's Sami and me with Stephen. (Sami knit that sweater she's wearing. Isn't it awesome?) My mother-in-law had recently visited Stephen's yarn store in Amsterdam, and she brought me this book. I brought it for him to sign, and it was his first time seeing the European version. Also, please notice that Stephen is wearing a leopard print onesie. 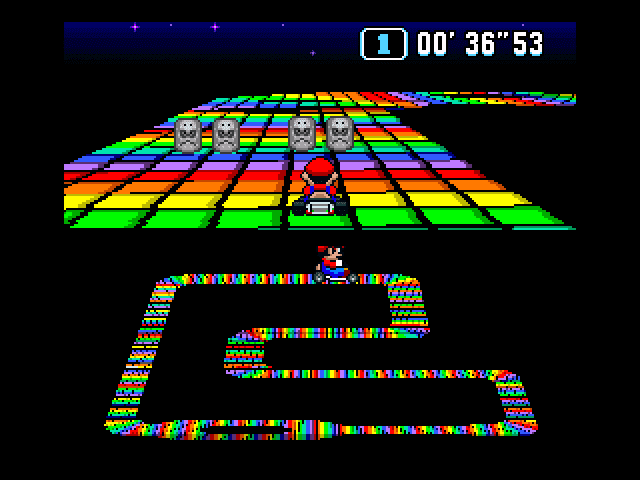 The coolest. At first I was really careful about choosing colors for the shawl. But then the shawl kept getting bigger, and I just thought well screw it. 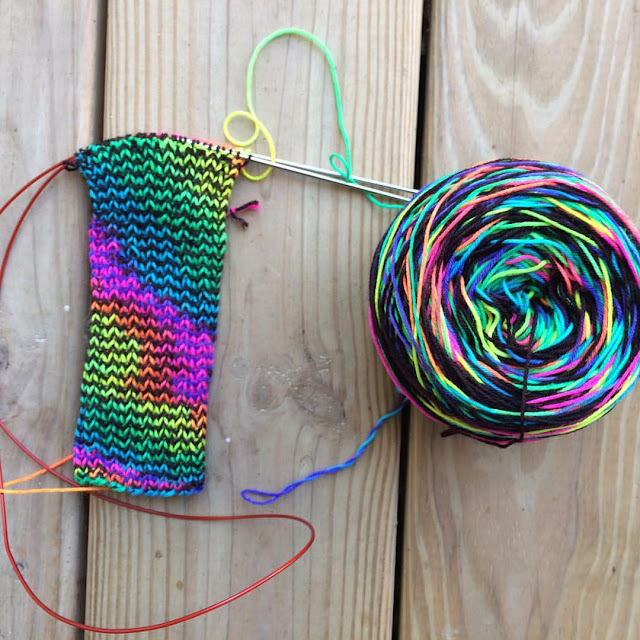 Let's just randomly start using yarn. Alex helped me pick a couple of colors, too. He really loves digging through those drawers full of yarn. If Stephen ever returned to Black Mountain, I'd probably go again. And again. And again. 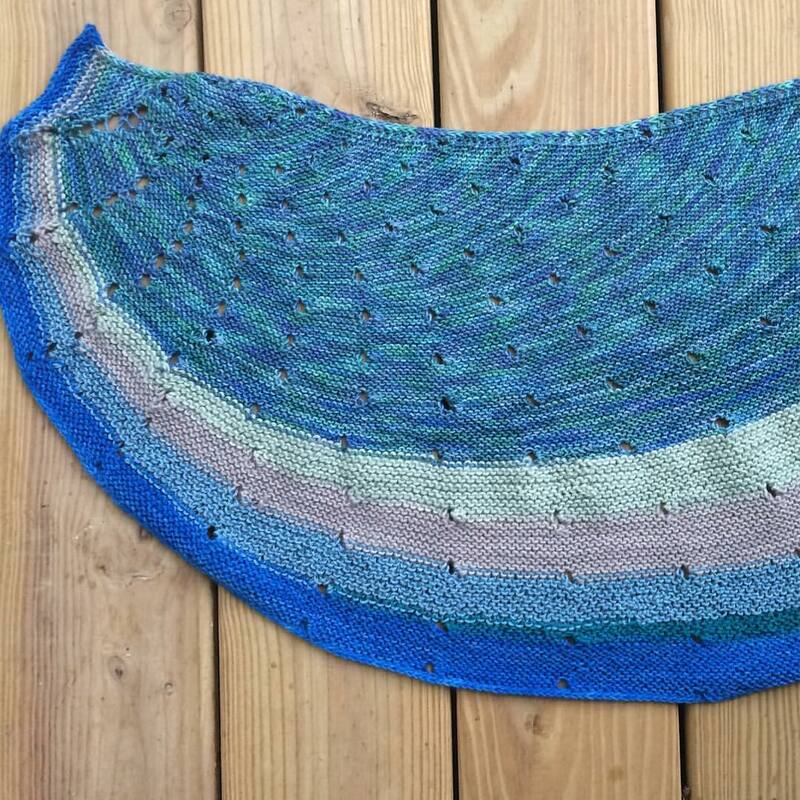 Have you ever knit any of Stephen West's designs? I'm ready to start another one. I just can't get enough of those colorful shawls -- like I need another shawl. I'm always sad when we have to put away the Christmas decorations, so it's nice to have some general winter-themed crafts that we can leave up through January (and hey, maybe even February). Snowflakes are a definite January decoration for me, and this Winter Snowflake embroidery is a perfect example. When I try to make something handmade for lots of friends, it's always a fail. So this past holiday, I looked for a gift that I could give lots of people. For inspiration, I went back through my Mollie Makes archive and found this adorable fox brooch kit that I hadn't even touched. I made the foxes assembly-line style and was able to whip up quite a few in just several hours while I watched embarrassingly crappy Christmas movies on Netflix. Yeah! Handmade gifts for all! Supplies: Felt, pin backs, and embroidery floss -- all from my craft stash! Woohoo!